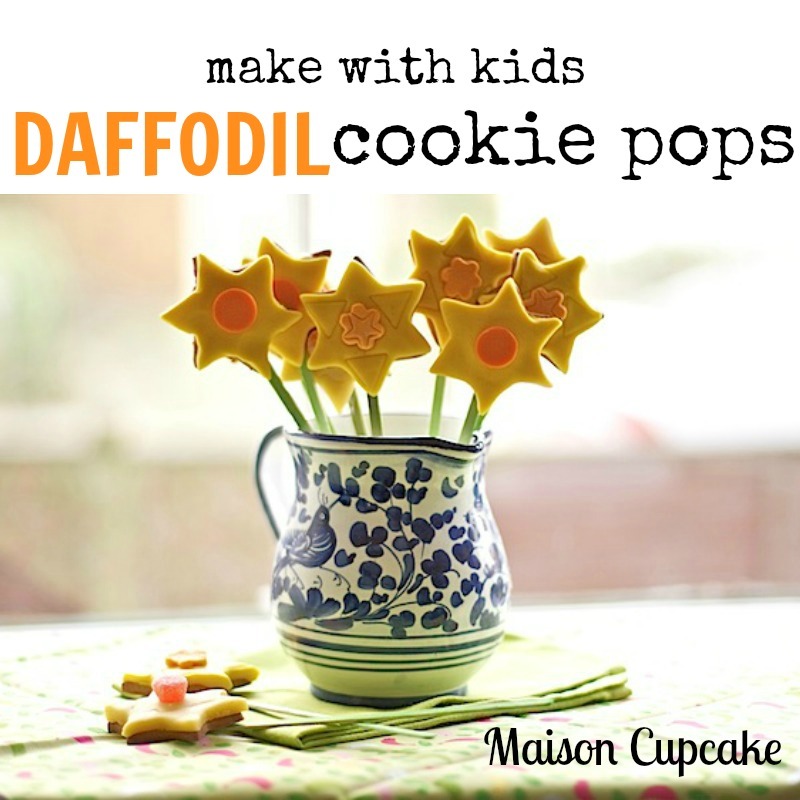 The perfect spring, Mother’s Day or Easter sugarcraft baking project to make with kids. 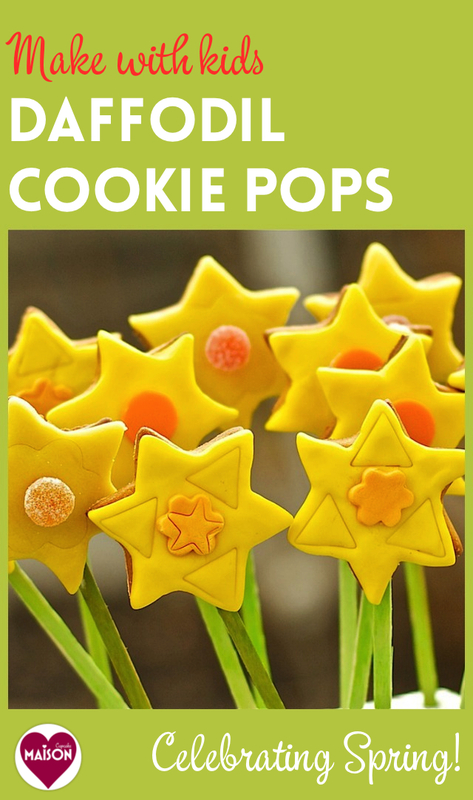 A bunch of daffodils epitomises this time of year however my google searches failed to uncover any easy Daffodil Cookie Pops quite like these. 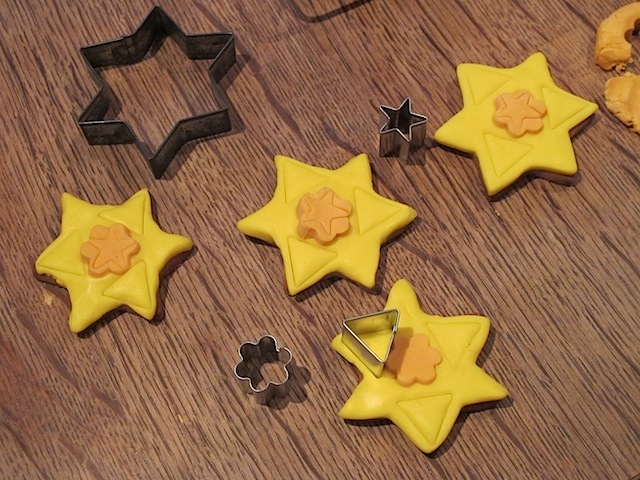 Take one basic roll out cookie dough, cut out stars, cover them with something yellow and dot something orange in the middle. Hey presto! 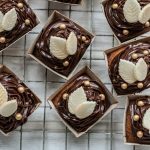 You’ve got the perfect edible gift for mum or teacher at the end of term. It’s really as simple as that. 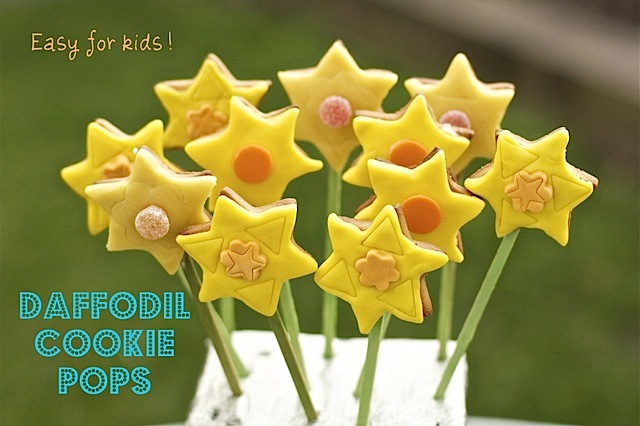 I will give you several variations how to cover these daffodil cookie pops below. 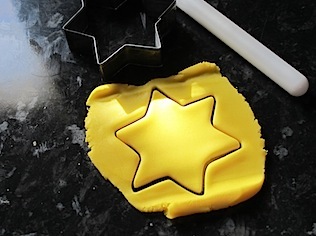 So long as you can find a vaguely star shaped cutter and something yellow and sticky to roll out, you can make them from items available from the smallest supermarket and without investing in any complicated equipment. In theory, any child dextrous enough to use Play Doh can help. Whether you pin them down long enough is another matter. 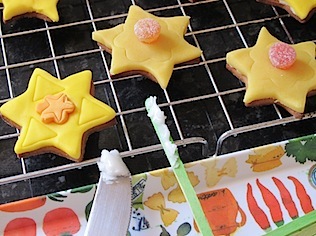 You can use the same cookie dough as my previous Hallowe’en biscuits which will make around 30 stars depending on size of cutter. Mine was about 6cm diameter. Remember smaller biscuits can burn more easily. 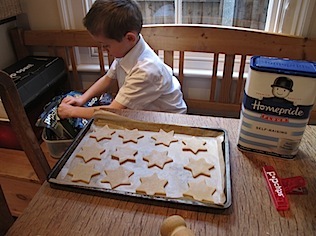 These little stars only took 7 minutes to bake at 180c / Gas 4. 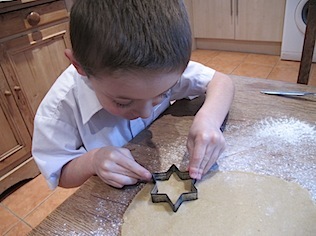 Things started well with Ted stamping out star shapes with the cookie cutter. But he was quickly distracted by his new game “hide loads of bags of crisps in random corners of the house”. 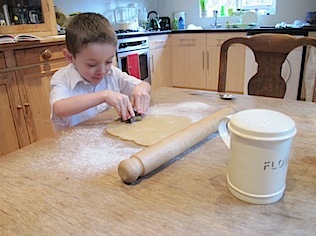 After the cookies were baked and cooled, I briefly coaxed him back to roll and stamp out some crinkly orange sugar dough circles for the daffodil centres. However I must confess a raucous episode of Peppa Pig pulled him away so I finished them off whilst he was at school the next day. I so LOVE kids baking projects you can drop what you’re doing in the middle then start again the next day! Life saver! 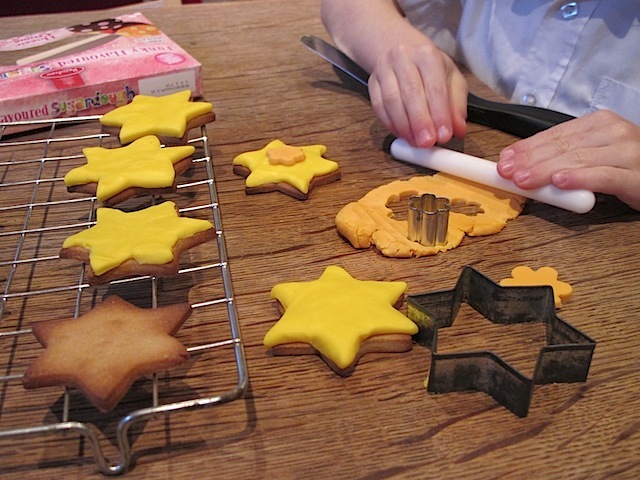 Despite the cooperation of my child on this occasion I can vouch this is SO easy that any non-Peppa Pig distracter three or four year old or over could help once you’ve rolled out the cookies. I was using these dinky cutters, as well as the main shape I imprinted triangles on the daffodils to give them a bit more shape. The stars just add a bit of impressionist character without being florally correct! Tall sticks made from coffee stirrers! Painted with diluted food colouring to tint them green. 1. 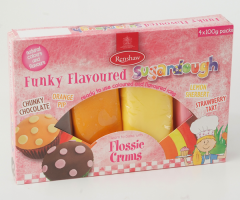 Renshaw Funky Flavoured Sugar Dough (above) as featured in my dinosaur cookie jigsaw post. 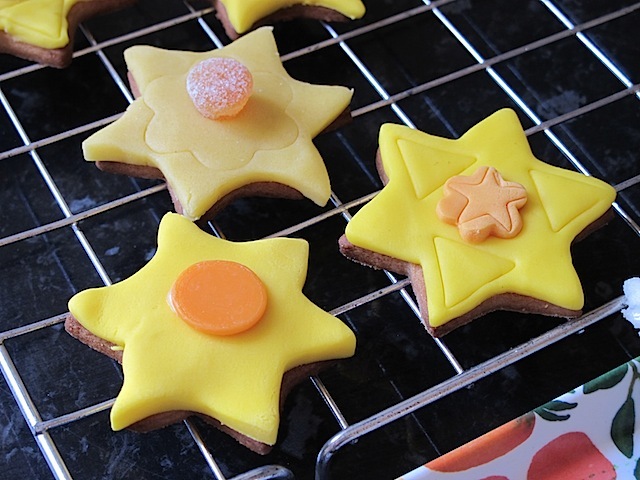 This has a pleasant lemon flavour and the bonus of being sticky enough to press onto the bare cookies with no further icing required to stick them down. 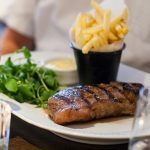 The stickiness however can work against you if you handle it too much – best to roll it after the briefest of kneading with cool hands. 2. Marzipan. Also yellow but a duller shade. Needs icing to stick down. 3. Yellow sugar paste. This definitely needs adhesion with icing to glue the stars down. I have used royal icing which keeps in a sealed tub for a few days. You can choose any of these options or a combination depending on materials you have available. 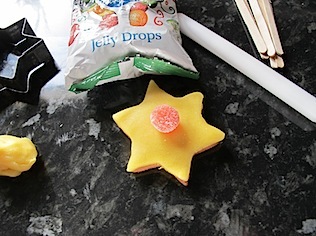 (The yellow sugar dough is very yummy though, you can buy it in Lakeland). Depending how thick you roll it out (however you like it! ), allow around 350g for 30 cookies. 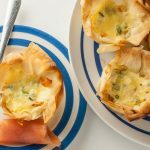 You can create an orange centre of the daffodil in a few ways. Most simply, you can press a jellied orange sweet or an orange Silver Spoon chocolate button (as previously featured in my evil pumpkin patch cupcakes) onto the yellow covering. Wilton Candy Melts also come in orange but aren’t as nice a flavour and a dustier finish. With slightly more effort you can roll out small crinkly circles of orange sugar dough or sugarpaste. 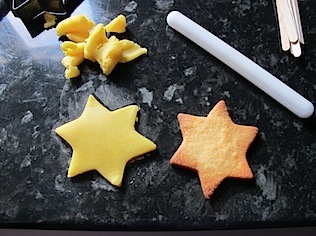 Marzipan and sugar dough appear sticky enough to keep stuff attached to them, sugarpaste will need a dot of icing. When the coverings are done, spread icing on the top few centimetres of the sticks and gently press onto the backs of the cookies. Gently place them face down on a wire rack with the orange protrusions poking through a hole! When they’re dry you’re done! You can either present them in a block of oasis wrapped in paper or stand them in a vase. I used a pot of Play Doh to make mine look taller! I’m full of ideas for more cookie ideas like this so I hope you like them! I’d love to share them with a spring themed event but don’t know who is doing one. If anyone can recommend somewhere do let me know in the comments below. 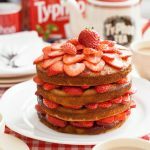 * to make royal icing, mix 300g icing sugar mixed with one large egg white or else use a little of the instant manufactured version, you only need 2-3 tablespoons worth so only make a full egg white’s worth if you will use it for other things in the next few days. 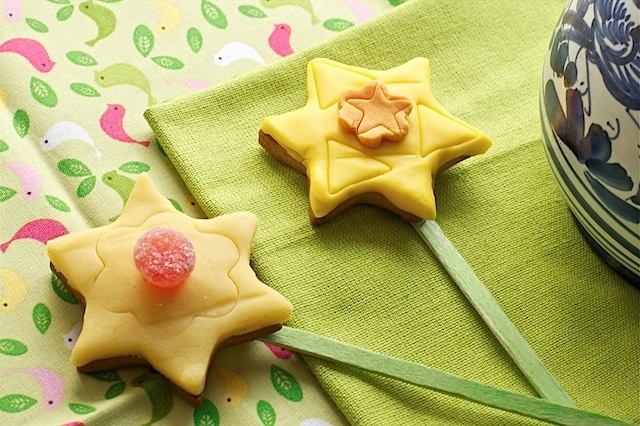 Cut the cookie dough into star shapes and bake on a lined baking sheet as directed. Dilute some green food colouring in a ramekin with water. 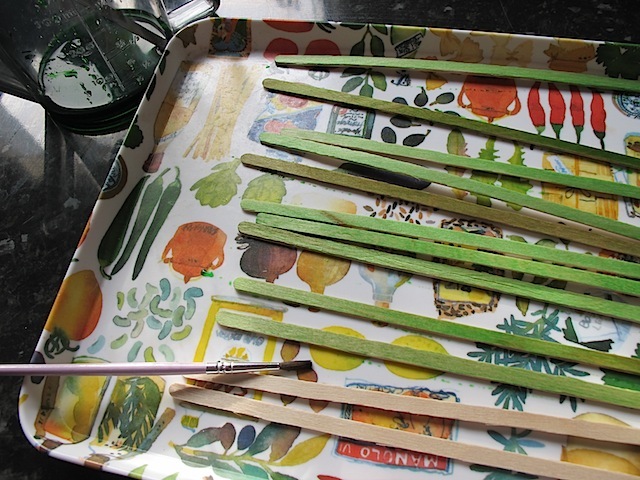 Paint it onto each side of the coffee stirrers and leave to dry on a plastic tray. Knead your covering of choice – (only lightly if it’s the sticky prone sugar dough), roll out with a scant dusting of icing sugar. 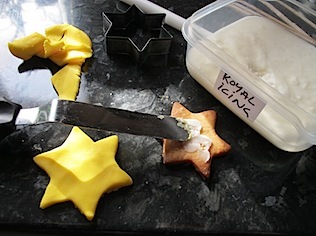 Cut out more star shapes and stick them onto the cooled biscuits with some royal icing. 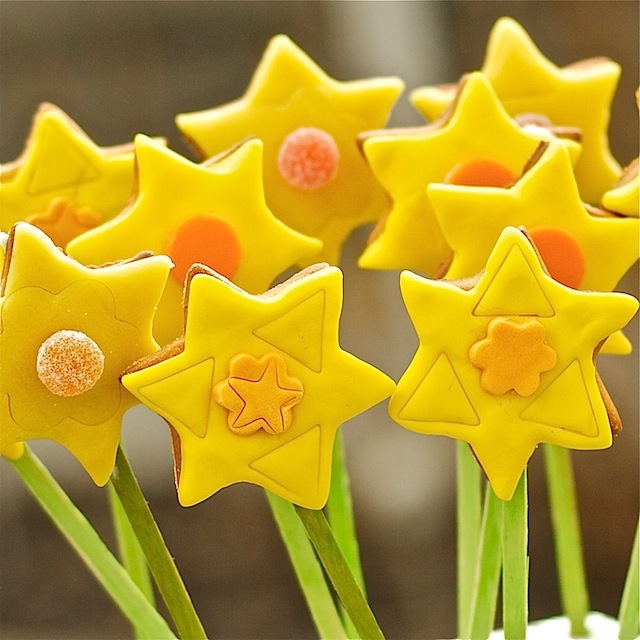 Dot on your orange daffodil centres of choice whether orange buttons, sweets or rolled cut outs of sugar dough or sugar paste. 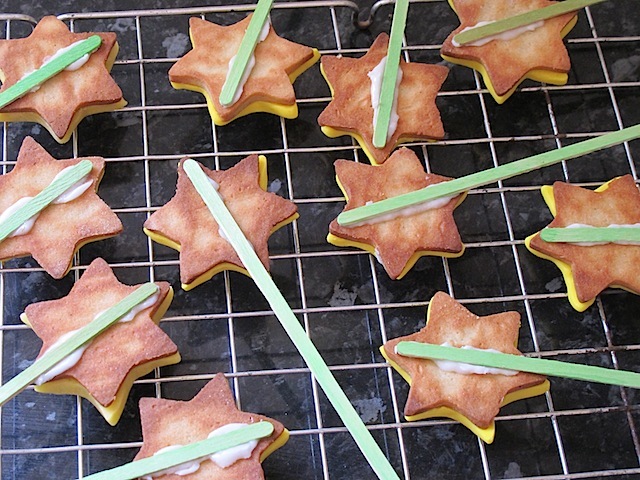 Spread some royal icing along the top few centimetres of each coffee stirrer and gently affix to the cookies. Leave to dry and present either in a block of oasis or a vase! Are you full of the joys of spring yet? Just fabulous Sarah. 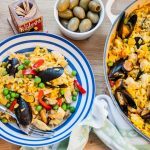 They look great and it is good to get helpers in the kitchen. Thanks Jacc! I hope soon he’ll be productive as well as enthusiastic! I had to to a double take! These are so cute! Love, love, love these!! Photos are ace and I can’t believe how something so simple can look so effective. I get why you were acquiring coffee stirrers now! Might need to get a few myself as I can see that they come in very handy. Would love more posts about other cookie ideas. Ha ha, yes you remember my clandestine trip to local coffee shop. Can you imagine me trying to refrain Ted from saying loudly to man at counter “we’ve come for the sticks” when I’d only bought smoothies. Thank you! I’ll have to ask my publisher if it might be stocked SE Asia, I know it will be in American but not sure about elsewhere. You’ll have to badger your bookstores! OOO, what a super idea! I love it. Ah yes I suppose some daffs are completely yellow. I’ve always liked the ones with orange bits! And a wine gum would be perfect. Thanks, they’re definitely dead easy to do. Just so you know – I would be willing to come and help you find all of the bags of crisps. 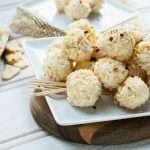 These look divine and so great to do with little cousins and godchildren! Have just sorted out some dyed eggs and Irish milkshakes (which may not be so suitable for under 18s). 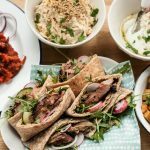 Found your blog through London Foodie! 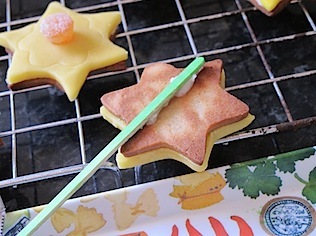 fabulous idea Sarah – i’ve got a star cookie pop tin that bakes the sticks on so will certainly be giving this a whirl. Did you find the pop chips after Ted hid them? Hope so coz they’re well delish! That cookie pop tin sounds super, I must look for one of those. 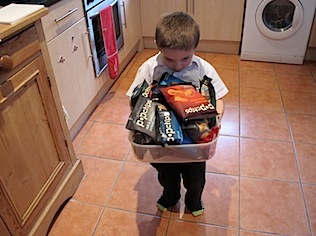 The Popchips were dotted around the house and I kept finding them all evening! how beautiful! these are fab. Cookie pops sound like fun. And less faff than cake pops! Beautiful! And look at the concentration on Ted’s face – so cute! 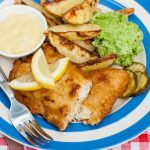 A perfect springtime project! Oh, those are so cute! Perfect for making with children. I love how spring-ish these are. Lovely project to embark upon with kids (and dare I say, even adults). Such a fun, creative idea. Daffodils always brighten my day. Thanks, they’re so easy and you only need a couple of things to make them. So cute, and the cookies are lovely too! lol I see I left a comment when you first published but love the story and how Ted got distracted! (though never known Peppa Pig to be raucous, I shall have to investigate! 😉 Where do you get the little cutters from. I want them! Doesn’t Ted look little! 2 years ago already!